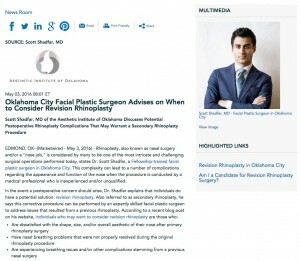 Scott Shadfar, MD of the Aesthetic Institute of Oklahoma discusses potential postoperative rhinoplasty complications that may warrant a secondary rhinoplasty procedure. Edmond, OK — Rhinoplasty, also known as nasal surgery and/or a “nose job,” is considered by many to be one of the most intricate and challenging surgical operations performed today, states Dr. Scott Shadfar, a Fellowship-trained facial plastic surgeon in Oklahoma City. This complexity can lead to a number of complications regarding the appearance and function of the nose when the procedure is conducted by a medical professional who is inexperienced and/or unqualified. For men and women who feel they meet these criteria, Dr. Shadfar suggests waiting at least six months to one year before pursuing secondary rhinoplasty. This should be an ample period for postoperative swelling to fully subside, after which time he says patients will have complete affirmation as to whether or not their expectations were met by their original procedure. Ultimately, Dr. Shadfar stresses that for anyone interested in revision rhinoplasty, the most important decision they can make is selecting the right surgeon. He recommends doing extensive background research into the credentials and training of the physician, asking questions, and making sure the doctor of choice has performed a wide range of secondary cases with excellent results. Dr. Shadfar was elected into the Alpha Omega Alpha national medical honor society and graduated at the top of his class from the University of Oklahoma Health Science Center. Subsequently, he completed his Otolaryngology-Head and Neck Surgery residency at the University of North Carolina as well as an esteemed fellowship program under Dr. Stephen Perkins, an internationally recognized facial plastic and reconstructive surgeon. Dr. Shadfar is a member of the American Academy of Facial Plastic and Reconstructive Surgery, and he is committed to furthering his skill and expertise through various research efforts within his field. To learn more, visit DrShadfar.com, facebook.com/AestheticInstituteOklahoma, and @DrShadfar on Instagram. Dr. Shadfar is available for interview upon request.